Spoilers through Outlander season 2, episode 9, “Je Suis Prest”. On the surface, “Je Suis Prest” is a simple episode, one that acts as a bridge between Outlander’s major plot events. 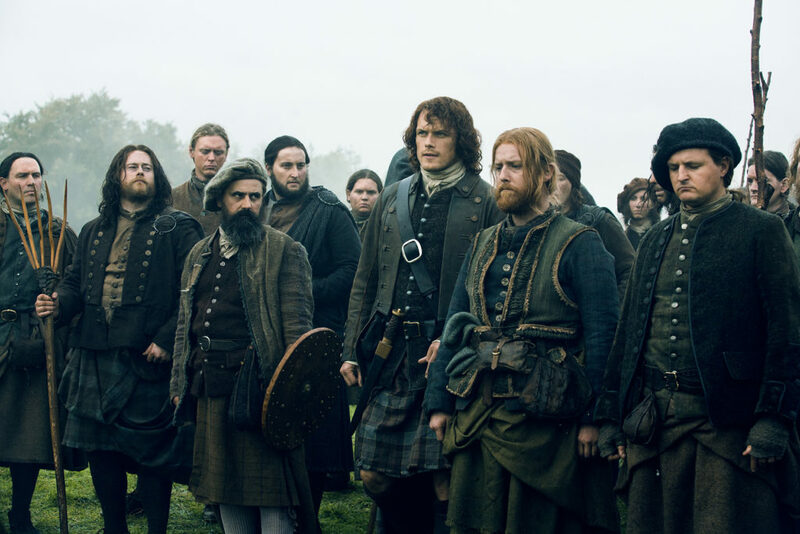 It’s not as tedious as “The Fox’s Lair”, nor will it prove to have as much action as next week’s “Prestonpans”, but for my part, it is the best episode of Outlander we’ve had. Why? It’s essentially a training montage episode. Nothing riveting occurs. The old Mackenzie crew is back together with Dougal, Rupert, and Angus returning to the fold. But outside of season one’s finale, “” and this season’s “Faith”, it has been the most emotional episode. It gives us a glimpse at the characters we love, who they are deep down, and how they handle adversity. Jamie, having acquired as many men as possible, is set to lead them to battle, but first they must train. It causes a rift between him and Dougal, as Dougal is eager to earn Prince Charles’ favor. Jamie knows the prince better than that, he knows the odds stacked against them, and he is less eager to ride off to war. He wants the men as prepared as they can be, because these aren’t men trained for battle. They’re blacksmiths and cottars, simple people armed with pitchforks. This difference of opinion causes a bit of a row between Dougal and Jamie, but Jamie stands his ground and reminds Dougal that he is in charge. They aren’t at Castle Leoch and Jamie isn’t a boy anymore. It’s difficult for Jamie to find that balance between familial respect and leadership. Dougal took care of him, protected him. He was his mentor and a father figure. Jamie looked up to him in many regards, so to toss those memories aside in favor of ruling is act not easily done. But he does for the good of his men. Jamie makes the hard decisions to show his fighters what war costs, even if it means lashing his own men for carelessness. Throughout the episode, Dougal fights back against Jamie’s wishes, calling him a coward and naive, but Jamie stands his ground. 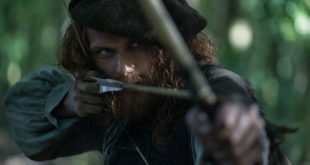 And when Dougal and his men make a careless mistake, letting a young assassin past their sentry to attack Jamie, it is Jamie who also takes a lashing, to prove that he is not approve reproach. Jamie, for all his charm and bluster in early episodes, is a born leader. And finally, by the episode’s end, Dougal has come to respect his place. 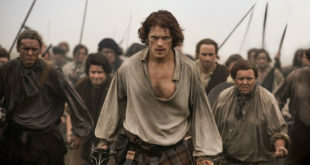 As much as I enjoyed watching Jamie as a leader, and Murtaugh boss around the baby Scots, it was Claire’s journey in “Je Suis Prest” that affected me the most. 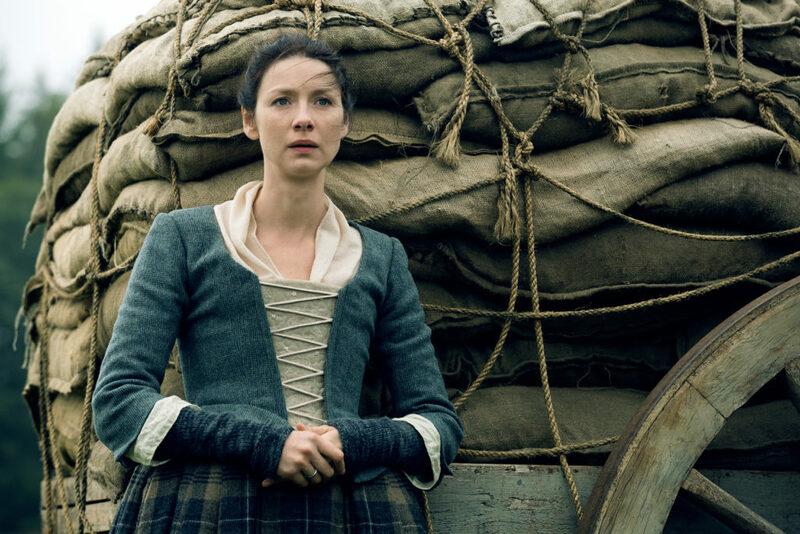 Of all the men preparing for war, it is Claire who has seen the worst of it, Claire who knows the harsh realities and recognizes that even a winning side endures heavy losses. During the training, Claire suffers from flashbacks to her time during World War II. She’s a lighter Claire back then, a younger Claire who still has hope in the world. In these flashbacks she learns her famous catchphrase, “Jesus H. Roosevelt Christ” and meets a pair of happy-go-lucky Americans, Corporal Grant and Private Lucas. She tries her best to be light-hearted in such a grim place, smilingly explaining the differences between American and English cuisine. As the flashback continues, the trio travels merrily along an empty road when a German tank fires upon them, expelling them from the Jeep into a nearby trench. Claire and Corporal Lucas are tossed to relative safety but it’s Private Lucas who is still injured, trapped under the rubble of the explosion in the middle of the road, screaming for help. When the Germans move past, Corporal Lucas decides it is safe to try to rescue Lucas, but is ultimately shot down, and Claire is left alone in the dirt, crying, with only the sound of the boy screaming for his mother to keep her company. Jamie notices the hollowness in Claire’s eyes as she does her duty throughout their camp, preparing for war and inevitable death. He asks her what is wrong, but like many who suffer from PTSD, she climbs inside her own mind for protection from the memories and tells him everything is fine. It’s only when he later finds her curled into a fetal position in the dirt that she admits what is wrong and tells him all about the horrors she’s seen, the deaths of those young boys in WWII, and how she sees them in the faces of all the other young Scots heading off their doom. There is no glory in war. Only the scarred memories of those unfortunate enough to survive it. The episode isn’t all doom and gloom, however. There’s an upbeat interaction between our lovely Fraser couple, after the assassin William Grey tries to cut Jamie’s throat. He interrogates the young lad, to no avail, and Claire, not wanting Jamie to hurt the boy, uses her quite wit and English accent to coax him into talking. It’s a lovely scene that reminds us of the bond between these two. I know I say this weekly and I’m not sorry for it, but there’s such a realism to the way Jamie and Claire bicker, to the way they fight and demonstrate such passion with one another that is not seen anywhere else. Claire isn’t afraid to put Jamie in his place and Jamie isn’t afraid to get on her nerves. I love every moment these two are together. In the end, the troops are ready to finally head out to meet the Bonnie Prince Charles and fight the redcoats, but you have to imagine, things won’t be as easy or as simple as they were in training. War awaits the Scottish. Next ‘Game of Thrones’ – “The Broken Man”: Family? What Family?